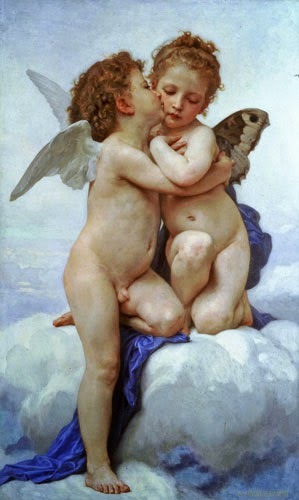 as Children) by William-Adolphe Bouguereau, 1890. Welcome back. Tomorrow, as you undoubtedly know, is Valentine’s Day. Cards, flowers, chocolate, dining out, hugging…they’re all fine, as are other gifts. But In the event that you find yourself with someone with whom you may become more, well, familiar, I thought I’d take this opportunity to review a recent report on intimate kissing--the kind we used to call French kissing, you know, when tongues and saliva make a social call into your partner’s mouth. Collaborating researchers from the Netherlands’ TNO Microbiology and Systems Biology, Micropia and VU University Amsterdam examined the effects of intimate kissing on oral microbiota. Focusing on microbiota composition, they enlisted 21 couples (42 volunteers), ages 17-45, who happened to be visiting a zoo. From each volunteer, they collected (1) a self-administered questionnaire on kissing behavior and related factors, and (2) tongue swabs and saliva samples taken before and after each couple kissed intimately for 10 seconds. Going further, to estimate the amount of bacteria exchanged during an intimate kiss, the researchers chose three couples. One volunteer from each couple consumed 50 milliliters of a probiotic yogurt drink before the three couples kissed intimately again for 10 seconds. Tongue swabs and saliva samples taken before the kiss from the yogurt-drinking volunteers and after the kiss from the yogurt-free volunteers tracked Lactobacillus and Bifidobacterium from the drink as marker bacteria. The composition of oral microbiota was more similar between couples that were partners than between couples that were unrelated individuals. This was especially true for the tongue, which hosts a more stable microbial community than that of saliva. Notably, the similarity of partners’ tongue microbiota could be less a result of intimate kissing than of simply living together and a shared lifestyle or environment. On average, the similarity of tongue and saliva microbiota did not change in any couple after a single intimate kiss. Incorporating self-reported kiss behavior, however, the researchers found the similarity of the transitory saliva microbiota required frequent and recent bacterial exchange and could be maintained only by kissing intimately at least nine times a day. One absolutely startling discovery from the study was the difference in intimate kiss frequency self-reported by partners of mixed-gender couples. Nearly 3 of 4 males reported higher frequencies than were reported by their female partners. On average, the males claimed 10 intimate kisses per day, while the females could apparently remember only 5. The researchers attributed this difference to male over-reporting, which they note has arisen in other self-reports of sexual behavior. Being a male, I find that extremely difficult to believe. Happy Valentine’s Day tomorrow! Thanks for stopping by today. Valentine flowers made of Hershey kisses.